Diao ye zong - Owaranu Matsuri · forums · community | osu! Last edited by tokiko October 29, 2017 at 8:13:28 PM GMT , edited 31 times in total. hope the map's quality itself will deserve that sb. poke me anytime if you wanna any support on this. 00:00:000 - Maybe add background blur for the first section of the map same as you did 02:22:772 - here? 00:14:889 (1,2,3,1) - This thing is surprisingly pretty hard to read. The offset seems better at ~865 for me. There may be problems because of storyboard explicity. I can't really tell what to do better in this situation, but just in case, if you're going to cut some elements, save the full storyboard and put it in map's description or smth. We discuss some rythm and emphase moments. Also gave tokiko some sb suggestions. the drum hs at quiet part (at the beginning or part start from 02:15:760 (1) - ) sounds too loud, low down the volume a bit. normal-hitnormal: this hs emphasis a so strong emotional sound like every other kind of beats are weaker than it. so this should only used at some special part, but not usually use them like a common hs (just like crash in drum track won't be a common hit by usual as well). consider remove some of them and let other ticks you wanna emphasize take more power of expressing the music. 01:39:848 (1,2,1,2) - i highly recommend you use big jumps among these notes, for this is like one of the most heated parts of the whole song. 02:37:658 (5,6,7) - these objs can have less distance for their jumps, even overlap them for this part. 04:31:526 (1,2,1,2) - and 04:59:556 (1,2,1,2) - and etc. as well. 05:25:176 (2) - a long slider instead? 05:30:650 (1,2,3) - spread them, such heated part deserve jumps. 05:37:658 (1,2,3) - and etc. as well. 06:18:385 timing line here is 1/4 gap off. 378385 → 378276 and remove timing line at 380027. you may consider beat at 06:18:385 (1) - 's head tick is a downbeat or white (1/1) tick, but actually it's a back clap at blue (1/4) tick. 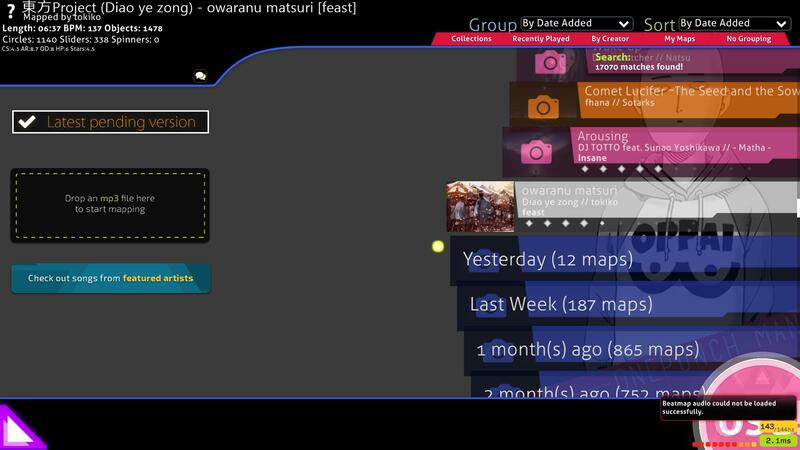 but seems like this map's timing is regular and consistent, for same song's part appeared at 03:11:818 (1) - as well, maybe the timing should not that tricky at that part as well. remove these two timing line directly is also an option, for that error is not quite obvious. so i highly recommend you find some guy check your timing of this song. this is some kind of must fix and must check. 01:39:848 (1,2,1,2) - i highly recommend you use big jumps among these notes, for this is like one of the most heated parts of the whole song. sure! this is some kind of must fix and must check. oops, my bad. i forgot to remove these lines after finishing the actual mapping uuuuuh..
02:02:183 (2,4) - a bit minor but consider avoiding the overlap to keep visual consistency with 02:05:687 (2,3,4) - 02:09:191 (2,3,4) - etc. 06:19:701 (1) - https://puu.sh/xRiqA/50ee538a7e.png better switch to vocal maybe? 02:02:183 (2,4) - a bit minor but consider avoiding the overlap to keep visual consistency with 02:05:687 (2,3,4) - 02:09:191 (2,3,4) - etc. okay! 23:27 PandaHero: 02:01:745 (1) -  а тут чего так тихо? 23:29 PandaHero: 01:58:242 (1) - а тут точно свисток? 23:33 PandaHero: долбёж из чего, прости? 23:33 PandaHero: Ты ж не клэпы туда хуйнул? 23:34 tokiko: я хуйнул нормал семплсет свой..
23:37 PandaHero: 02:43:789 (1,2,3,4,1,2,3) - где клэпы??? 23:39 PandaHero: 02:43:789 (1) - а тут пусто сейчас? 23:44 PandaHero: 03:50:359 (1) - тут же нормал финиш на башке должен быть? 23:47 PandaHero: 04:18:388 (1) - бля, зачем тут клап и финиш вместе? 23:50 PandaHero: во втором киае тоже поднял громкость, да? 23:53 PandaHero: 06:27:037 (1) - а тут точно клэп? 00:11 PandaHero: А лога недостаточно будет?